Common Smartcard – Hier finden Sie ausführliche Informationen rund um den einheitlichen Kartenkodierungsstandard openCashfile. 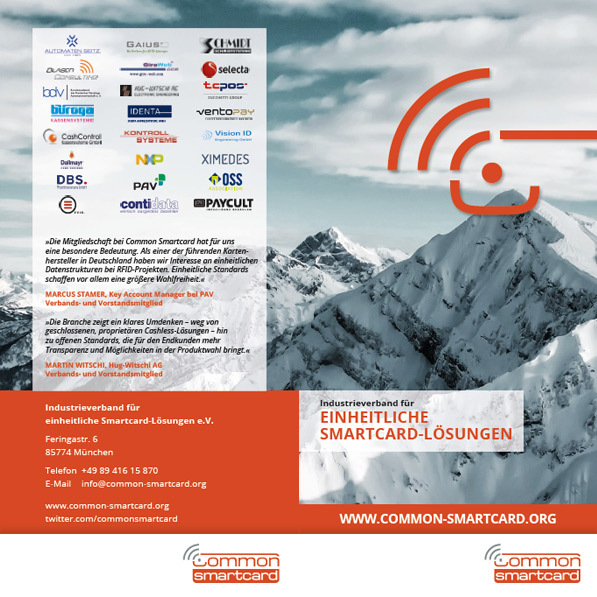 Der The Common Smartcard Solutions Association (Industrieverband for einheitliche Smartcard-Lösungen e.V.) is dedicated to fostering standardised data structures for RFID applications. The key focus is on openCashfile – an innovative smartcard data structure which allows all those involved in the project to operate with one and the same data base. This creates transparency and security of investment. openCashfile is used in institutional and industrial catering, campus and leisure projects as well as access control.